This Game of Thrones Lannister Shield Pin features the golden Lannister lion. Based on the actual prop shield seen in the series, this reproduction is 1.4 x 2.1 inches, made from zinc alloy with an antique finish. 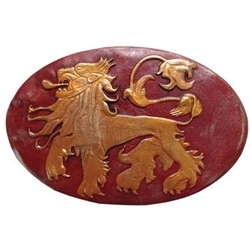 House Lannister of Casterly Rock is one of the great houses of the Seven Kingdoms.